Complementing my daily blog interviews, today’s Author Spotlight, the one hundred and fifteenth, is of children’s author and novelist Debbie Dadey. Debbie Dadey is a former teacher and librarian. Her passion is writing books for reluctant grade school readers. With ten series and forty-seven million copies of her 151 books in print, titles like Slime Wars continue to enchant boys and girls alike. Debbie’s first series, which she co-authored with Marcia Jones, The Adventures of the Bailey School Kids, is one of Scholastic’s top three best-selling series. Her newest series, Mermaid Tales with Simon and Schuster, gives students a chance to enjoy a fun story while learning about the ocean and its inhabitants. The first two titles are Trouble at Trident Academy and Battle of the Best Friends. A Whale of a Tale will be out soon. Our response was always, “How do you write stories by yourself?” We happily collaborated on almost one hundred children’s books, starting with The Adventures of the Bailey School Kids series. 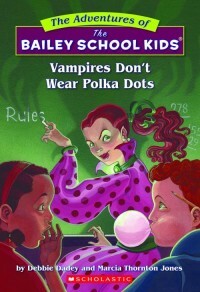 Our first book was Vampires Don’t Wear Polka Dots. It was an individual book that developed into a series. Working with my writing partner, Marcia Thornton Jones, gave me the courage and confidence to try writing on my own. Something my father, Voline Gibson, said also helped me. He said, “Debbie, if other people can write books then so can you.” I decided he was right. Why couldn’t I? It was easy to say, but hard to put into action. I don’t know about other authors, but whenever I start a new story I am very nervous. Every bad thought enters my head. “Can I really do this?” “What am I thinking?” To put all those thoughts out of my mind, I sneak up on my story by writing an outline. Coming up with a plan makes me forget my doubting side and gets me very excited about creating the story. It also breaks the sometimes overwhelming task up into manageable chunks. For A Whale of a Tale, book three in the Mermaid Tales series, I did what I do with every story. Before I even started my outline, I did research. For this particular story, I needed to study and find out everything I could about whales. I watched videos and interviewed someone who had actually been in the water alongside humpbacks. That research helped make my outline richer and gave me fun tidbits to put into the plot. I tried not to insert an overwhelming amount of facts into my fiction, but just enough to make it more interesting. Not only have the Mermaid Tail books given me a chance to channel my inner girl for reluctant readers, it’s also given me a wonderful opportunity to write about ocean ecology and marine life. I’m having a great time including a glossary of sea creatures at the end of every book. The five main merkids in the story also share reports of what they’ve learned. Kiki, a mermaid from Asia, is particularly concerned with protecting her habitat. The glossary is also included on the new mermaid section of my website, www.debbiedadey.com. I’m also on Facebook, Twitter, and LinkedIn. The blog interviews will return as normal tomorrow with multi-genre author Micki Peluso – the four hundred and seventy-seventh of my blog interviews with novelists, poets, short story authors, biographers, agents, publishers and more. A list of interviewees (blogged and scheduled) can be found here. If you like what you read, please do go and investigate further. And I enjoy hearing from readers of my blog; do either leave a comment on the relevant interview (the interviewees love to hear from you too!) and / or email me. :*) You’re very welcome, thank you for taking part.